Heat a deep pan/skillet. Add a tablespoon of clarified butter/ghee and let it melt. Add the shredded carrot and saute (approx 15 mins.) on a low flame until the carrot changes color to caramelized color/light brown. Take care not to burn the carrot. The raw smell should also disappear by now. Add Milk and allow to boil until the mixture begins to thicken and carrot turns tender. Mix thoroughly until Milk evaporates completely. Remove from stove. Garnish with mixed nuts and sprinkle the cardamom powder ( if needed). 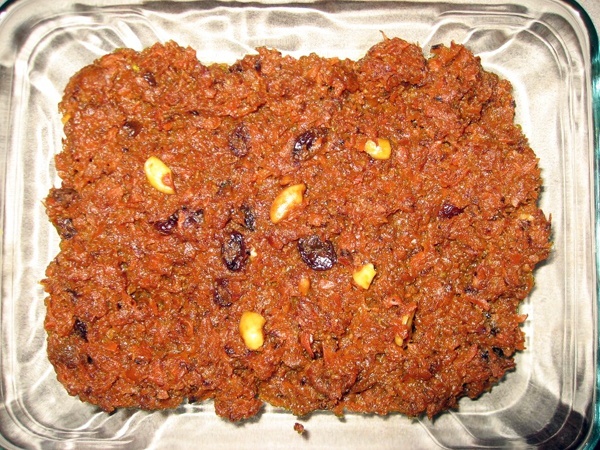 This entry was posted in All Recipes, Desserts and tagged Carrots, Gajar, hulwa by Kamakshi. Bookmark the permalink.